Philips 32PHT4509 review | What Hi-Fi? Finally, a 2014 Philips TV that does standard-definition well! 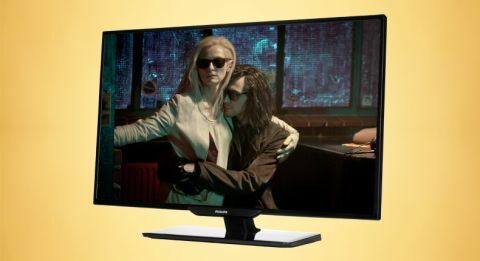 The company’s Full HD line-up has struggled to win our good word when it comes to upscaling DVD-quality content, but this 32in LED from the 4000 Series bucks the trend. Does that have something to do with its HD Ready-only panel (its 1366 x 768 resolution being much nearer to standard definition’s than Full HD screens are)? Possibly. But while resolution may be lower than on some rivals, the set’s wallet-friendly £280 gets you an awful lot when it comes to features and performance. Design is not much of a talking point, mind. Its light, super-slim build is practical, yet very basic. The remote – in-line with the range – is cheap-looking, has rubbery buttons and a flat body that’s not particularly nice to hold. The buttons are well spread out, though. With essentials such as BBC iPlayer, Netflix, YouTube and Facebook joining Spotify, Blinkbox and more, the Philips certainly isn’t shy on apps. Skype is also installed, though you’ll need to purchase Philips’s TV camera to benefit. An internet connection is necessary and that’s where an ethernet cable comes in handy – the TV is only ‘wi-fi ready’ so Philips’s USB Wireless Adapter (£27) is essential to make going online a wire-free affair. The adapter will take up one of the TV’s two USB slots, which accompany two HDMI, a scart and component inputs, as well as one digital and headphone output apiece. The interface isn’t flashy and customisable like some, but the screen-wide home menu does the trick. Menus could be more user-friendly; it’s often a long journey to get from A to Z. And be warned that the TV picture is completely replaced by the screen-hogging EPG when loaded. The app page is better: its comprehensive grid format and bold icons easy to navigate. With wireless functionality, it can be used for general remote functions and home-network access. Sci-fi drama Transcendence on Blu-ray reveals the TV’s downscaler as capable. The sharp, clear picture is instantly watchable and detail is abundant. Properly adjusted, colours are punchy and full-bodied, the futuristic computer’s flashy lights appearing accurately intense. Detail is abundant: as we observe close-ups of surgical experiments, the patient’s fine wrinkles and dripping sweat on their face is palpable. As Johnny Depp nears his inevitable fate, his withering face is truly telling, and as we move from labs to deserts, odd bits of shrubbery and greenery are precisely outlined. That said, the Philips lacks the subtlety of the best screens. Load up Star Trek Into Darkness on DVD and it seems only a little less sharp than the high-definition picture. Detail remains sky-high, and colours are true and deep. And as the camera jumps around to keep up with Spock and Khan’s fight, the picture remains stable. The Freeview tuner keeps its end up, too. Flick between the standard and HD BBC Two channels as they air the European Athletics Championships and it’s a punchy picture on both. It’s not the subtlest, but enough detail shines through to keep you watching. Expectations are generally low for a TV of this size, and the Philips only just meets them. It’s not the worst we’ve heard, but action films like the aforementioned Star Trek generally sound harsh and shrill through its 20W speakers. Apart from its shortage of subtlety and a few gripes with sound (it’s a bit on the shrill side), the Philips has a lot going for it. For a mere £280, an insightful, refined picture and selection of smarts aren’t qualities to be ignored.